You are the architect of your own life: it is yours to make or to mar. By the power of thoughts you are building; are you building aright? The thoughts that pass through your mind are responsible for everything that happens in your life. Your predominant thoughts influence your behaviour and attitude and control your actions and reactions. As your thoughts are, so is your life, so you have to be careful of what you think. Thoughts are like a video cassette that is played in the VCR of the mind. What you play in that video is what you will see and experience in your life. What you think is what you live. To make changes in your life it is necessary to eject the old video cassette, and insert a new one – one that you want and like. The power of thoughts and its importance on our lives has recently been re- discovered by spiritual seekers and several books have been published. 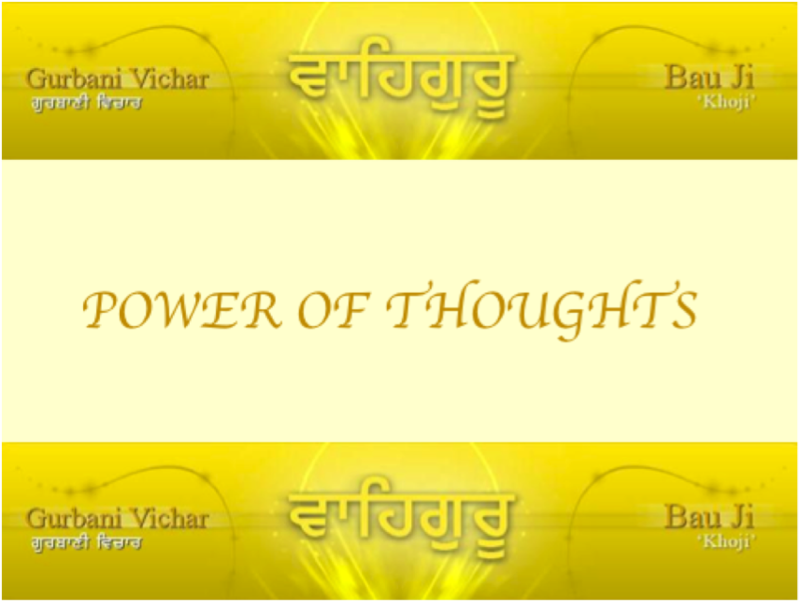 However, we have been very fortunate that Bauji brought this concept to our attention over 35 years ago, in the light of gurbani, with its important spiritual consequences. We have often talked about this in children’s classes at various samagams. In fact, almost any topic that we have touched upon, inevitably enforces the importance of being aware of our thinking. More and more children have expressed the desire to read and understand the “secrets” Bauji imparted to us. The lekh “POWER OF THOUGHTS” has been made audible and separated into chapters below so that you may read and listen to a chapter at a time if necessary. There are 10 chapters altogether followed by a conclusion. All are exactly what appears in the original writing. In some places however, some words that may be hard to understand by smaller children have been clarified. It might be a good idea to listen to one or two chapters a day and then finally, listen to the conclusion which is a grand summary of everything in the chapters. Similar to the technique used by our Gurus, Bauji made a point of repeating things so that we may catch the concepts sooner or later. In fact, you will be amazed at the ‘new’ revelations you will make each time you listen. Certainly, repetition seems to be the key. If you wish to read along, you may also download the written version here. By the way, two beautiful comments were added to our last blog – the ‘Love Messages’! Always look forward to hearing from you. What a treasure Bauji has left us! The onus is upon us to find and use these gems to enrich out inner lives.